Triple Eclipse Award winner Ramon Dominguez, who has captured the Thoroughbred racing world's Best Jockey trophy for the past three seasons, was unable to be at January's Eclipse Award ceremonies at Gulfstream Park in Hallandale Beach, Florida, as he is fighting to recover from the serious injury he sustained at Aqueduct Racetrack on January 18, one day before the Eclipse Award event that honored the best performers of 2012. On January 18, 2013, just two weeks into the new Thoroughbred racing season, veteran jockey Ramon Dominguez, 36, suffered a nightmare injury when he was thrown from the back of his mount, Convocation, in the day's seventh race at Aqueduct Racetrack in New York. Convocation apparently clipped the heels of the horse in front of him, Sovereign Default, which led to a stumble and the tossing of Dominguez. 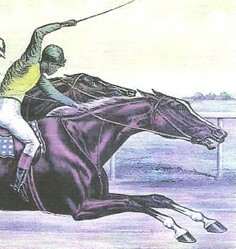 Convocaton was the race's 4-5 favorite and appeared in good striking distance before the sudden contact. Dominguez was on his feet and helped off the track after the spill, but taken by ambulance to a medical facility and later reported by his wife, Sharon, to be resting stably with a bruised eye and undergoing observation at the Jamaica Hospital Medical Center. However, a later CT scan discovery pronounced Dominguez had sustained a fractured skull, according to an Associated Press report that said Dominguez's agent, Steve Rushing, gave out the information after learning of the scan results from Dominguez's wife. A later informational release from Sharon Dominguez said her husband was transferred on January 30 to Burke Rehabilitation Hospital, White Plains, New York, after spending 12 days at New York-Presbyterian Hospital/Weill Cornell Medical Center. Evaluations were conducted at Burke on January 31, and Dominguez began brain injury rehabilitation the next day. Currently, Dominguez continues inpatient therapy for the fracture and is "improving every day," his wife stated. "Although his injury will take time to heal, Ramon is on the road to a full recovery." she said in the release. Top Rider Bill "Willie" Shoemaker and Others Helped Guide This Organization in the Past -- It Is Simply Called "The Jockey's Guild"
A native of Venezuela, where he began riding Thoroughbreds at the age of 18, Dominguez in 2012 completed a three-year consecutive sweep as the top American-based jockey in earnings. Last season, Dominguez scored 322 wins on the New York Racing Association circuit alone. His mark was also tops in the nation, and he earned a total of $25,582,252, also a figure that led all riders. His New York dominance included four five-win days and two six-victory cards. In total for 2012, Dominguez triumphed in 341 races from 1,398 starts. He collected 10 grade one wins on the year. Dominguez's earnings in 2012 eclipsed the record of single-season winnings held by Hall of Fame jockey Jerry Bailey, who pulled down $23,354,960 in 2003. Hall of Fame rider John Velazquez and fellow jockey Javier Castellano appeared at the podium on January 19 to accept Dominguez's third straight Eclipse Award on behalf of the injured jockey. Dominguez, who rode to victory in the United States for the first time at Hialeah Park in 1996, lives in New York with his wife and two sons, Matthew and Alex. The Thumbnail used on this post is courtesy of a photo of an old Currier and Ives creation displayed at Wikipedia and reduced to fit here.